Kita kembali berhimpun dan bermesra bersama keluarga bersempana dengan musim perayaan selepas kejayaan menuai pada tahun ini dan kita mengucapkan syukur kepada Allah atas keredhaanNya megurniakan limpah rezki yang berterusan. Kesempatan ini saya mengucapkan selamat bergembira bersempena dengan pesta Gawai yang dirayai pada musim ini. Dalam merayai kegembiraan berpesta, saya menyeru kepada semua, untuk memikirkan sejenak hala tuju masa depan kita dan generasi kita yang akan datang. Sepertimana yang kita ketahui bahawa negeri Sarawak adalah sebuah negeri yang kaya-raya dengan sumber seperti hasil hutan dan hasil petroleum. Namun, kita merasa dukacita sebab hasil negeri yang sepatutnya diagih dengan adil kepada segenap lapisan rakyat telah dibolot oleh hanya segelintir pihak yang telah diberi amanah mentadbir negeri ini. Baru-baru ini kita telah melihat bahawa rakyat tidak boleh lagi menerima ketidak-adilan yang dilakukan oleh pihak kerajaan. Ratusan ribu rakyat telah berarak tanda sokongan kepada himpunan BERSIH 3 yang menuntut supaya pilihan raya diadakan dengan bersih, adil dan saksama. Dalam perhimpuna tersebut kita telah menyaksikan bahawa sesungguhnya, kerajaan berlaku zalim dan bertindak kejam dengan mencederakan ramai rakyat yang tidak berdosa. Urutan peristiwa itu, beberapa orang pemimpin termasuk Saudara Anwar Ibrahim dan Saudara Azmin Ali telah didakwa di bawah akta baru, iaitu akta Perhimpunan Aman. Justeru, kita harus bertanya kepada diri kita sendiri mengapa Kerajaan BN tidak menyokong dan menperakui tuntutan rakyat untuk mengadakan pilihan raya yang bebas, adil dan saksama dan mengapa sebaliknya menghukum mereka yang menuntut pembersihan proses pilihan raya. Bersempena dengan Hari Gawai pada tahun ini saya menyeru supaya semua lapisan rakyat Sarawak bangkit menentang cabaran BN dalam PRU13. Ketahuilah bahawa setiap undi anda akan menentukan keadaan anak pinak dan cucu-cicit kita pada masa hadapan. Saya menyeru anda supaya dapat mengimbas kembali, apa yang telah anda capai dan perolehi sejak sekian lama berada di bawah pemerintahan BN. Mengapa masih terlalu ramai rakyat yang tidak menikmati elektrik, mengapa masih terlalu ramai rakyat yang tidak menikmati bekalan air bersih, tiada jalan raya yang sempurna, tiada kemudahan perkhidmatan kesihatan yang sempurna, keciciran pelajaran, tiada peluang pekerjaan yang mencukupi. Mengapa Kerajaan di bawah BN hanya turun ke kampung-kampung membuat janji dimusim pilihan raya? Berapa banyakkah janji-janji init telah ditunaikan? Saya berkeyakinan bahawa rakyat Sarawak akan bertindak seperti saudara mara kita di semenanjung Malaysia, dimana mereka telah bertindak dengan menolak ‘ketidak-adilan’ yang telah sekian lama dilakukan oleh BN. Kita tidak akan mengambil mudah anggapan bahawa Sarawak sebagai ‘simpanan tetap BN’. Mari kita berganding bahu, bersatu tenaga untuk memastikan kebebasan mengundi untuk semua rakyat bagi melahirkan sebuah kerajaan yang benar-benar bersih, amanah, bertanggungjawab dan telus. Kerajaan baru Pakatan Rakyat akan memastikan keadilan dan kesaksamaam hak untuk semua rakyat. Apabila keadaan ini menjadi kenyataan, maka kita akan dapat merayai kejayaan penuaian dalam erti kata sebenar “Marayai Gawai Dayak atas dasar kegimbiraan yang bukan hanya senyum dibibir tetapi kehembiraan yang terbit dari hati nurani. As we return home to be reunited with our families to celebrate and give thanks to God for his blessings in another bountiful year, I would like to wish you all a happy and meaningful harvest festival. Amidst the merrymaking and the feasting, however, I urge everyone to take a moment to think about the future of Sarawak and the generations to come. It is well-known that Sarawak is a land blessed with great wealth in the form of its forests and oil deposits. Sadly, this wealth has not been equitably distributed to the people of this land. Over the years, the bulk of this wealth has been plundered by those who were trusted to govern the state. Politicians and the well-connected have been enriched at the expense of the people whose lives are deeply rooted to the land. The greed of these people knows no limits, as evidenced by the many cases of land grabbing taken to court and the revelations made by investigative journalists such as Sarawak Report. There is a profound saying by Mahatma Gandhi: Earth provides enough to satisfy every man’s needs, but not every man’s greed. It is time to curb the greed of the ruling elite - the rakyat must rise up to protect their rights and claim back the heritage that has been stolen from them. Recently the people have shown that they are no longer willing to accept the injustices perpetrated by the current government. Hundreds of thousands came out to support the call for clean elections at Bersih 3, exercising their rights to peaceful assembly. The authorities injured many innocent citizens that day by violent means. Recently, a few notable people including Anwar Ibrahim and Azmin Ali have been charged under the new Peaceful Assembly Act. We must ask ourselves why the BN government does not support the call for free and fair elections and punishes those who call for the election process to be cleaned up. This Gawai season, I call upon Sarawakians to rise up to the challenge of PRU13, to treat your votes as sacred and priceless. Your votes represent your future and the future of your children and grandchildren. I urge you to reflect on what you have achieved after so many years of BN rule. Why is it that so many are still without access to electricity, clean water, proper roads, healthcare, education, employment and advancement? Why is it that the BN government only goes to visit your villages to make promises during election year? How many of these promises have been fulfilled? I am confident that like our brothers and sisters in Peninsula Malaysia, Sarawakians are no longer willing to accept the injustices that we have been subject to. We will no longer be taken for granted by the BN as their fixed deposit. Let us exercise our free will to vote for a new government that is competent, accountable and transparent. A new government of Pakatan Rakyat will restore justice and equality for everyone and work towards a just distribution of wealth for all Sarawakians. When that eventuality materializes, we can truly look towards celebrating bountiful harvests and ever improving prospects during the Gawai Dayak season. Aliran is deeply concerned at the incognito abduction of popular London-based Radio Free Sarawak deejay and democracy campaigner Peter John Jaban soon after his arrival in Miri. According to RFS founder-editor Clare Rewcastle-Brown, Peter John was abducted by a group of “three unidentified plainclothes personnel” after the car he was travelling in was intercepted on the route from Miri Airport into Miri town. Commonly known by his moniker ‘Papa Orang Utan’, Peter, 48, was earlier detained in Kota Kinabalu Airport while on his way back to Miri for the Gawai Dayak Harvest Festival. There he was photographed and his documents photocopied by Kota Kinabalu police before being escorted onto his plane. 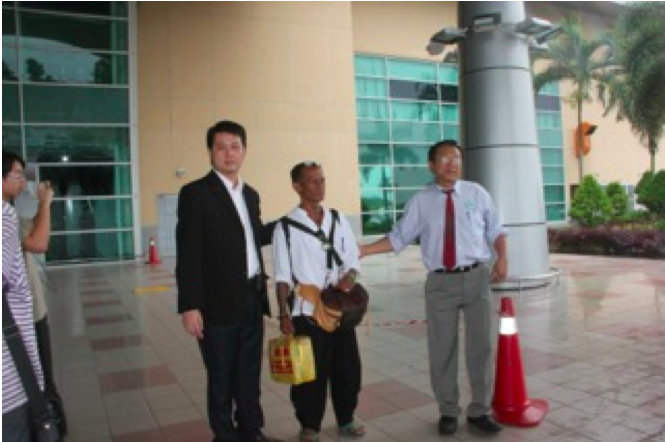 He was also informed that he would be detained by Special Branch on his arrival in Miri. Although Peter was met on arrival in Miri by a group of police personnel, no arrest was made as they apparently had not received any instructions to proceed with an arrest. This allowed Peter to leave the airport accompanied by Miri PKR leader Dr Michael Teo and DAP State Assembly member and lawyer Alan Ling. Their car, however, was later intercepted and Peter whisked away by the abductors who refused to disclose their identities. Peter John’s only ‘crime’ is that he is critical of the deeply corrupt BN regime in Sarawak led by nepotistic Chief Minister Abdul Taib Mahmud. 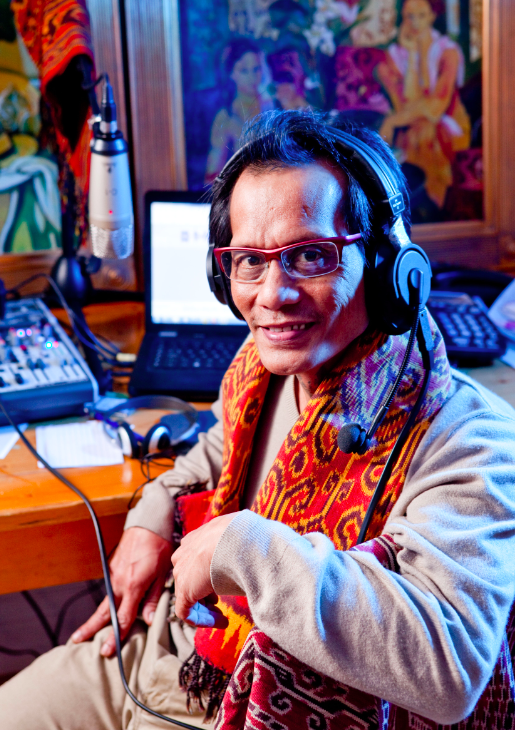 His popular Iban language radio call-in programmes, aired for two hours daily, have provided a platform for local people to speak out about their ongoing woes, about poverty, their lack of access to public infrastructure and amenities, deforestation, land grabs and ruthless BN leaders. Miri Criminal Investigation Department (CID) deputy chief ASP Ooi Jin Bing has denied police involvement in Peter John’s abduction and disappearance. Ooi has also insisted that the three abductors were not police personnel. Peter John’s current whereabouts remain unknown. He is known to be under medication for high blood pressure. Aliran calls upon the Home Minister and police to immediately investigate Peter John’s mysterious abduction and disappearance. Failure on the part of the police to act decisively will only fuel damaging public suspicion and speculation that can only further erode public confidence in the police force’s integrity, professionalism and respect for democratic freedoms, human rights and the rule of law. What’s Happened To Papa Orang Utan?! “We just hope it is the police and not Taib’s people”, one of Peter’s friends observed today. It was a comment that sums up the mistrust and fear in Sarawak. The truth is that this afternoon no one can be sure what has happened to Peter John Jaban, known as Papa Orang Utan by listeners of the Radio Station Radio Free Sarawak. He was flagged down from his car on the way from Miri airport into town at around 11am by 3 men travelling in another vehicle. He went quietly, we presume on the assumption that they were from the authorities. However, nobody knows if they really were and no one has heard from him since. The Miri police have denied all knowledge of any arrest and there has even been speculation that he ‘went with friends’. To say that colleagues at Radio Free Sarawak and his family are worried is an understatement. If he is under official arrest then there are fears that he may be poorly treated. But, if this is some form of unofficial arrest, and certainly procedures appear not to have not been conducted properly, then those fears are magnified. Many assume that Peter was abducted and this kind of arrest should not take place in a country run according to therule of law. However, as the hours have passed by without news, others are starting to wonder if such a development could have really have taken place ? Maybe, it has been a huge misunderstanding, because even in Malaysia an arrest should be reported? The radio DJ has been on vacation for the past weeks and had come back to Malaysia under cover in order to avoid threats that had been made against him by certain people in positions of responsibility, who have retaliated against criticism levied by the radio show. 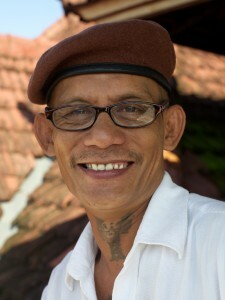 He had been hoping to spend some time travelling and to enjoy the Gawai season with friends and family. But, he was detained this morning at Kota Kinabalu airport as he attempted to fly Air Asia to Miri. He texted colleagues to say he had been arrested and then photographed, his documents copied, before being escorted on to the airplane. This communication was sufficient for friends and supporters to scramble together a waiting party for Peter’s arrival 40 minutes later at Miri. The local Miri Branch Chairman of the opposition PKR party, Dr Michael Teo, had come to the airport with a lawyer, Alan Ling. There were also several journalists there to register Peter’s arrival. Dr Teo, speaking later to Radio Free Sarawak said that there was a large police presence at the airport and everyone expected Peter to be arrested. However, either because of the potential publicity or because instructions were not yet clear, they seem to have refrained. 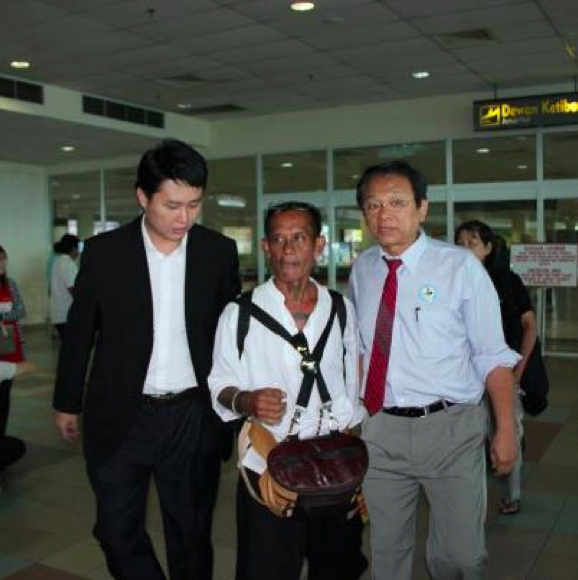 Peter was escorted out by his lawyer and the PKR representative. But, friends did not have long to celebrate Peter’s escape from the authorities. It was soon learnt that the car in which he was travelling with Dr Teo was flagged down shortly after he left the airport and he was asked by three men to get out of the car and to accompany them. “Peter just did as he was told” explained Dr Teo, who is still suffering shock in the aftermath of the traumatic experience. ”It happened so quickly that I didn’t really understand what was happening. We had expected him to be arrested at the airport and I think he thought this was now the special branch people. But, they did not identify themselves. I just don’t know”. The possibility remains that Peter Jaban had linked up with friends, who had come to meet him. However, worried family members are wondering why his phone is still switched off and they have heard nothing. Where is Peter and what are they doing to him? Supporters of Radio Free Sarawak are now anxiously trying to find the DJ. The opposition Assemblyman and human rights lawyer See Chee How has flown to Miri from Kuching this afternoon and is working with other lawyers to identify Peter’s whereabouts and secure his release. Earlier today he explained that no one can be legally detained without charge for more than 24 hours and Peter should have been properly informed of his rights and given access to a lawyer at the time of any arrest. The police officers (if they were police officers) should also have identified themselves. However, this afternoon the Miri police claimed they were not involved in any arrest, which has raised concerns further about whose hands Peter has fallen in to or whether he has just run off in fear. Anwar later requested the Home Ministry to explain why they are making use of the police force to put pressure on political opponents. 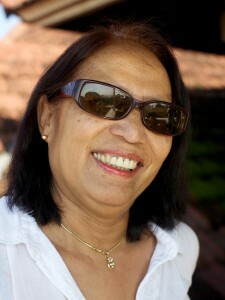 Fellow RFS presenter, Christina Suntai, whose own brother also suffered the indignity of arrest last year during a land grab dispute (which he later won) has also spoken out. “If anyone is perceived as a threat to the present government, whether they are fighting for their land or the right to speak out, then they use the police against them and find some way to accuse them of a crime”, she said. “However, the people in BN, who are in power, get away with all kinds of crime and no one does anything she said”. We will update this developing story. Rafizi: Why me and not NFC chief? Stand Up For Your Rights – A Win For Sebangan! “They Put Me At Risk” – Xenophon Sues!